Harpa – Reykjavik Concert Hall and Conference Centre, designed by Henning Larsen Architects in collaboration with Batteriið Architects and Studio Olafur Eliasson, has won one of the most prestigious architecture awards worldwide, The European Union Prize for Contemporary Architecture – Mies van der Rohe Award 2013. The European Commission and the Fundació Mies van der Rohe have announced the five finalists who will compete for the 2013 European Union Prize for Contemporary Architecture – Mies van der Rohe Award. Harpa is one of the five nominated buildings. In total, 335 works in 37 European countries were nominated for the award. It is only the second time in the history of the award that a Danish designed project is in the final. In 2001, Nordea Bank’s headquarters in Copenhagen was in the final. This building is also designed by Henning Larsen Architects. Harpa – Reykjavik Concert Hall and Conference Centre has won two international awards in one week. On Friday 2 March, Harpa was selected as winner at the annual ‘Civic Trust Awards’ and on 7 March, the Concert Hall will be recognised as ‘Best Performance Space 2012’ by one of the world’s largest travel magazines, American Travel+Leisure. More than 300 international projects were short-listed for the prestigious ‘Civic Trust’ Award, which was presented at a ceremony in Edingburgh on 2 March. The award is given to projects of high architectural value that have contributed to the social, cultural or economic development of the local community. Launched in Britain in 1959, the purpose of the award scheme is to recognise outstanding architecture and landscape planning. The ’Best Performance Space’ award of Travel+Leisure will be presented at a gala dinner in Berlin on 7 March together with a number of other awards significant to the travel industry. A jury consisting of six members from the world and design and architecture has selected Harpa as this year’s winner in the performance space category. The new concert hall in Iceland, Harpa – Reykjvaik Concert Hall and Conference Centre, has been selected as one of the world’s ten best concert halls – uniquely combing world-class acoustics and distinctive architecture. The distinguished British magazine, Grammaphone, is behind the selection, featuring in its January issue. Harpa is designed by Henning Larsen Architects in collaboration with Batteriið Architects and the facade in collaboration with the Danish-Icelandic artist Olafur Eliasson. The acoustic design was developed by Artec Consultants. The new concert hall in Iceland, Harpa – Reykjvaik Concert Hall and Conference Centre, has been selected as Building of the Year by the leading Swedish magazine for Nordic architecture and design, FORM. Harpa is designed by Henning Larsen Architects in collaboration with Batteriið Architects. The spectacular south facade has been developed in collaboration with the Danish-Icelandic artist Olafur Eliasson. The south facade of Harpa is inspired by the geological basalt stone formations along the Icelandic coast. The remaining two-dimensional facades and roof build on the geometry of the south facade. The glass captures the light of the sun and colours of the sky and appears as a giant, illuminating sculpture, reflecting the sky and harbour. The building changes colours depending on the weather and time of day and year. With a festive musical programme, the new Reykjavik Concert Hall and Conference Centre, Harpa, was officially inaugurated on Saturday 20 August. The opening took place in connection with the annual jazz and cultural festival of Reykjavik, and the Concert Hall hosted numerous concerts throughout the day. Harpa is designed by Henning Larsen Architects in collaboration with Batteriið Architects. The spectacular south facade was developed in collaboration with the Danish-Icelandic artist Olafur Eliasson. Inspired by the geological basalt stone formations along the Icelandic coast, the south facade rises up 33 metres. The facade is made up of a breathtaking three-dimensional structure of steel and glass. On Saturday night, the facade lighting was revealed to the thousands of people present. The remaining two-dimensional facades and roof build on the geometry of the south facade as a cut through the three-dimensional shape. The glass captures the light of the sun and colours of the sky and appears as a giant, illuminating sculpture, reflecting the sky and harbour and the vibrant city life. Made up of more than 12,000 m2 glass, the building changes colours depending on the weather and time of day and year. Art and architecture are beautifully united in the 28,000 m2 Concert Hall. The arrival area and foyer are situated in the front part of the building, the four music and conference halls in the centre and the backstage area with offices, administration, rehearsal and dressing rooms in the rear end of the building. Artec Acoustic Consultants is behind the acoustic design, which has already received great reviews in connection with the many opening concerts during the summer. Harpa – Reykjavik Concert Hall and Concert Centre forms part of an extensive development plan for the east harbour in Reykjavik – with the objective of bringing the city and harbour closer together. Thus, the building will become a landmark in the area and at the same time a symbol of the economic recovery of Iceland. Henning Larsen Architects won the assignment in an international competition in 2005. Harpa’s opening celebrations begin today, May 4, 2011, and run through August 20, 2011 when the building is inaugurated and the façade is illuminated during Reykjavík’s Culture Night. Today, Harpa presents the highly anticipated opening concert, featuring a performance of Beethoven’s 9th Symphony by the Iceland Symphony Orchestra (ISO), led by its Conductor Laureate Vladimir Ashkenazy. Celebrations will continue on May 13, with an impressive opening program featuring performances by The Icelandic Opera, the ISO, as well as Icelandic pop diva Páll Óskar, pop/indie rock group Dikta, and funk sensation Samúel J. Samúelsson Big Band, among many others. On Saturday, May 14, Harpa will host its first open house, which will include tours of the building, as well as more musical events and performances. On May 15, Harpa will present a Children’s Festival in celebration of future generations of Icelandic musicians. A striking addition to the Icelandic and European cultural scene, Harpa ‐ Reykjavík Concert Hall and Conference Centre (www.harpa.is), will open its doors to the public in May 2011. Harpa unites the most important classical music and performance venue in the country with an international conference centre. Offering a diverse range of performances, from classical to contemporary, it is home to the Iceland Symphony Orchestra (ISO) and The Icelandic Opera. Harpa also serves as a tourism and business hub, providing flexible facilities for programs and international events. Harpa’s façade was designed by renowned artist Olafur Eliasson and Henning Larsen Architects, the building by Henning Larsen Architects and Batteríið Architects, and the performing arts venues acoustics and theater design by Artec Consultants Inc. Harpa is a landmark in the redevelopment of Reykjavík’s historic harbour and waterfront area, and a symbol of Iceland’s renewed dynamism. Designed by Henning Larsen Architects and Batteríið, the 28,000 square‐meter (301,000 square‐feet) building comprises four main halls, including the 1,800‐seat concert hall, several meeting rooms, and a spacious exhibition area. Seen from the foyer, the halls form a massif with the Main Concert Hall as its red‐glowing centre. This inner massif contrasts the expressive and open façades, thereby generating a dialogue that defines Harpa’s public space, continued in the square in front of the building. This will be realised in dark shades to juxtapose the crystalline exterior. The surroundings are thus incorporated into the architectural concept. 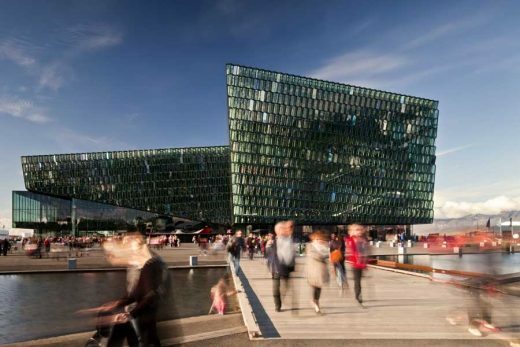 As Harpa takes its beginning long before visitors step into the foyer, the activities of this cultural institution are merged with city life. Harpa’s multi‐faceted glass façades are the result of a unique collaboration between renowned artist Olafur Eliasson and Henning Larsen Architects. The design is based on a geometric principle, realized in two and three dimensions. Reminiscent of the crystallised basalt columns commonly found in Iceland, the southern facades create kaleidoscopic reflections of the city and the striking surrounding landscape. Natural light is a key element, dramatically altering the transparency, reflectivity, and colours of the facades as the weather and seasons change. The assemblage of the glass‐and‐steel façade is under way and will be completed in the late summer 2011, while a large section of the north side of the building facing the ocean has already been erected. March 1, 2011, Reykjavik, Iceland – The box office for Harpa – Reykjavik Concert Hall and Conference Centre opened today, offering tickets to Harpa’s highly-anticipated opening concerts launching in May 2011. The first concerts in the new landmark concert hall will take place May 4 and 5, 2011, and will feature the Icelandic Symphony Orchestra, led by Conductor Laureate Vladimir Ashkenazy, performing Beethoven’s Ninth Symphony, work by Icelandic composer Thorkell Sigurbjörnsson, and a piano concerto by Grieg in A-minor performed by piano prodigy Víkingur Heidar Ólafsson. Tickets are also available today to the concert of German tenor Jonas Kaufmann, which is presented as part of the Reykjavík Arts Festival. Other events on sale in the next few days are a concert by Icelandic pop star Páll Óskar and Spanish flamenco-fusion band Ojos de Brujo, also part of the Reykjavík Arts Festival, as well as other concerts of the Iceland Symphony. In addition to the May 4 and 5 concerts, Harpa will also launch with a special opening concert featuring other musical acts to take place on May 13, 2011, followed by an open house for the public on May 14, and a special children’s day on May 15. The programs for these events will be announced at a later date. This autumn, Harpa will become the home of annual music festivals in Reykjavík, in keeping with the centre’s aim of presenting a wide variety of music, and welcoming performers of all musical genres. Harpa, Reykjavík’s new Concert Hall and Conference Centre will open on May 4, 2011. Designed by Henning Larsen Architects with acoustics by Artec Consultants Inc and a façade by Olafur Eliasson in collaboration with the architects, Harpa is to become home to the Iceland Symphony Orchestra and the Icelandic Opera, and thus a major addition to the Icelandic and European cultural scene. It is the most ambitious cultural project in Iceland as well as an endeavor of great importance for the community. 29 June 2010, Reykjavík, Iceland: Pétur J. Eiríksson, Chairman of Portus, announced today that the official opening and opening concert by the Iceland Symphony Orchestra at Harpa, Reykjavík’s new Concert Hall and Conference Centre, would take place on 4 May 2011. The opening concert will be conducted by Vladimir Ashkenazy. On 14 May 2011, Harpa will stage a grand opening program featuring a diverse range of music events and many of Iceland’s most prominent musicians. This program will be broadcast live on Icelandic National television. Designed by Henning Larsen Architects with acoustics by Artec Consultants Inc and a façade by Olafur Eliasson in collaboration with the architects, Harpa is to become home to the Iceland Symphony Orchestra and the Icelandic Opera, and thus a major addition to the Icelandic and European cultural scene. It will also serve as a tourism and business hub, providing flexible facilities for programs and international events. The façade was designed by Olafur Eliasson in collaboration with Henning Larsen Architects. With acoustics conceived by Artec Consultants Inc, one of the most reputable experts in the field, and equipped with the most technologically advanced sound, staging and presentation systems also designed by Artec, the 28,000 square-meter (301,000 square-feet) complex will be a striking landmark in the redevelopment of the historic harbour and waterfront area, and a symbol of the country’s renewed dynamism.Henning Larsen Architects also consulted with Batteríið Architects to conceive the building. The main contractor is ÍAV. Harpa is expected to become a hub in the city’s vibrant music scene and to attract an audience of culture, architecture, and art enthusiasts as well as major international business and trade events. Based on a cooperative model, it will allow for a mix of large conventions, receptions, concerts, exhibitions and public programs that can all happen simultaneously. It will also be home to restaurants with direct views across the harbour. The opening artistic program will be announced in the autumn of 2010 and will offer a diverse range of performances, from classical to contemporary. It is being developed under the guidance of artistic adviser Vladimir Ashkenazy and international consultant Jasper Parrott. Harpa is run by Portus and Ago, administrative structures which respectively own and operate the building and its programs. Pétur J. Eiríksson is the Chairman of Portus and Thorunn Sigurdardottir, the former Director of the Reykjavík Arts Festival, is the Chairman of Ago. Managing Director for both companies is Hoskuldur Asgeirsson. Portus and Ago are owned by the Icelandic state and the City of Reykjavik through holding company East Harbour. Harpa’s name comes both from the name of the string instrument and the ancient Icelandic name of a month in the old Nordic calendar, which marks the beginning of summer, a period of particular importance in Iceland. Harpa’s logo was designed by The Icelandic Ad Agency and consists of a ring of outstretched tuning forks. It finds its roots in a classic and universal symbol of music arranged in a way that also resembles the sun or a snowflake. The circular arrangement calls to mind people coming together and represent the 12 months of the year, while the forks’ colours symbolize the colours of the different halls. The multi-faceted glass façade by artist Olafur Eliasson in collaboration with the architects is based on a geometric principle, realised in two and three dimensions. Reminiscent of the crystallised basalt columns commonly found in Iceland, the southern façade create kaleidoscopic reflections of the city and the striking surrounding landscape. Natural light is a key element, dramatically altering the transparency, reflectivity, and colours of the facades as the weather and seasons change. The quasi bricks of the south facades contain LED lights in different hues that make Harpa glow long after the sun has set. The brightness and colour of each module can be controlled and adjusted as needed. The assemblage of the façade is already under way and will be completed in late summer 2010. Throughout the design process, emphasis has been placed on giving Harpa enough versatility to host large and intimate events simultaneously and without interference with one another. Harpa’s facilities, which offer some of the most technologically advanced equipment available, are thus capable of accommodating everything from large conventions, concerts, and exhibitions to smaller banquets and meetings. With acoustics design and technical facility planning provided by the world renowned Artec Consultants Inc, designers of the Jazz at Lincoln Center space, the Bartók Béla National Concert Hall in Budapest, Sala São Paulo and the Culture and Congress Center in Lucerne, Switzerland, Harpa will join the ranks of the most prestigious international concert halls in the world, as a prominent member of Artec’s family of halls. In addition to hosting an array of international music events, Harpa will also become home to the esteemed Iceland Symphony Orchestra and Icelandic Opera, both known for their professional artistic programs. Reykjavik has been waiting for decades for this new hall and its addition to the city´s energetic musical life. The main concert hall, the largest of four in the Centre, is capable of accommodating up to 1,800 people. A spacious entrance hall is located on both the first and second levels and is the ideal space for exhibitions, large banquets, and receptions. There are two meeting halls on the first level as well as various smaller meeting rooms. Additional amenities include boutiques, a viewing balcony, a bar and restaurant with direct views across the harbour, a ground-floor bistro, catering, and underground parking options.